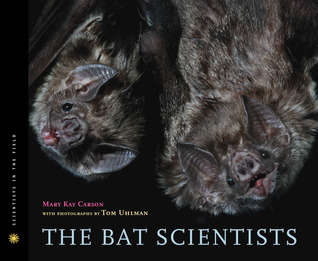 Perhaps since I still had bats on the brain, I ran across a children’s/YA book on bats. It’s called The Bat Scientists. The author is Mary Carson and the photographer is Tom Uhlman. I was really impressed with both its information and photography. The updated edition came out just this month and has the latest information on WNS and conservation. Even though it’s a children’s book, it seems like a great quick introduction for adults and teenagers, and has materials in the back for further research. A few facts from the book, some I knew, some were new to me. Bats aren’t blind-they see fairly well. They aren’t going to get tangled in your hair-bats avoid people and fly too well to get in hair. Bats are often called flying rats or mice, but they aren’t rodents. Some scientists think they’re primitive primate relatives. Less than one half of one percent have rabies-they’re not crazy flying animals out to get you. It also mentioned an interesting project I’d not heard about. The Bellamy Cave Project. Apparently Bellamy Cave in Tennessee is a major hibernation cave for the endangered gray bat. Last year the Nature Conservancy is mad a concrete cave nearby. The idea was that a concrete cave could be cleaned out and disinfected come spring, hopefully slowing the spread of WNS. They had limited time last year and finished construction after hibernation started, but they did have a few guests. They’re hoping to see more visitors this year since the precast/prefabricated concrete cave will be ready and the proper temperature in time for hibernation season. An adorable barn owl plush Arras made awhile back. Losing Altitude is a kickstarter project I’m tangentially connected with. It will be a collaborative art book highlighting endangered bird species from all over the world. Arras (animuspanthera on both deviantart and etsy) has gathered dozens of artists (also from all over the world) to illustrate their favorite endangered species in their own unique styles. Each illustration will be accompanied by information about the species. There’s already have a tease of some of the gorgeous and exuberant art that will be included. Pia Ravenari is working on some intricate and stunningly colored parrots. And Tania Avila Villalba has a strikingly austere Javan hawk-eagle. Not having the illustrative skills to contribute directly I offered some of my tree and key pendants to use toward incentives. but lost cousins coming home. Meteorites are natural objects composed of stone, metal, or a combination of the two that have survived their fall from space through our atmosphere. Most meteorites come from asteroids, a small percentage from Mars and the moon, a very few may even originate from comets. Those that come from asteroids are the oldest objects that are available for direct study. (As opposed to the light from ancient stars, which we can see but not touch…) They date back about 4.5 billion years, to the first stages of the creation of the solar system. So they can give scientists insight into the processes that made our sun and its planets. Stone meteorites are mostly silicate rock very much like Earth’s crust. Iron meteorites are actually iron with different percentages of nickel. The stony-iron meteorites are just that. Though what’s really neat is that some have crystals of the gemstone peridot (or olivine) in them. So when you see a sample it’s this literally space age slice of metal with green gems embedded in it. Just to confuse things–meteors–the ones you see in showers and normally are associated with the orbits of comets–don’t generally become meteorites. It’s very rare for there to be enough material to be recovered, the norm is complete vaporization. Meteorites start as larger objects, called meteoroids. One would be travelling at around 67,500 mph when it hits our atmosphere and is slowed by the friction. The outer part melts off and the droplets are carried away–at this point, though slowed by the atmosphere it is still moving fast enough to create shock waves. As it cools and falls the melted surface forms a glassy coating known as a fusion crust. Once it (or its pieces if it explodes in the air) hit the ground it’s officially a meteorite. 40,000-60,000 tons of ‘extraterrestrial material’ fall to Earth every year. Most are almost dust grains, smaller than 1 mm. Around a thousand meteorites bigger than a soccer ball strike the Earth’s atmosphere every day. Yes, people have been hit by meteorites… I wonder if insurance covers that? If you’re in the northeastern US you can now find some of my fossil wire work jewelry in the gift shop at the Connecticut Dinosaur State Park. It’s a small place, but a great visit on a nice day. 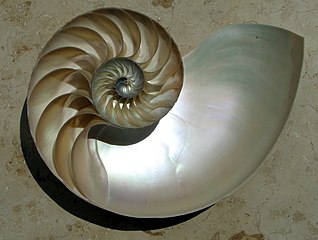 The centerpiece of it is a fossilized track made by carnivorous dinosaurs in the early Jurassic. 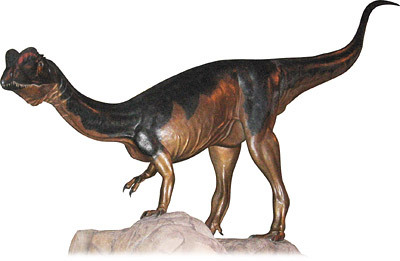 (Think something like Dilophosaurus from the movie Jurassic Park.) It also has some displays for children explaining how fossilization occurs (and why a good area for fossilizing tracks is a poor one for fossilizing bones), and interactive exhibits on local geography with specimens children can handle. They also have some very pretty short walking trails, with periodic signs explaining the geological history of the area and talking about the local species and their natural history. My favorite is that they have an arboretum with unusual species, and some interesting conifers. With labels! It really bugs me when botanical gardens don’t actually identify the species, so it’s a touch I appreciate when I find it. Besides, the people there have a good/offbeat sense of humor. They had a sign “It’s a gneiss day, don’t take it for granite!” So following that wisdom my friend and I went for a short hike to take advantage of a nice sunny day.